Committee’s job is to select the best four. Period. They do not cure inflation. They do not fix the Electoral College. They do not turn Justin Bieber into a musician reasonable people can stand to listen to. They pick four teams for the playoffs. They do not make the Mid-American Conference a major league in professional football. They do not forgive Southern Cal's three early season losses. They do not erase the Pitt game from Penn State's resume. They just pick the best four teams. If you are asking anything more out of the members of the College Playoff Committee, you are yelling into the wind. The Committee was created to pick the four surviving teams out of a college football season. That's all. They were mandated to transfer the college game from an argue-about-it proposition to a best-of-four playoff tournament. They do not open the door for a three-loss team. They do not dance to your team's fight song. You say that isn't enough for you? You say you'd rather have an eight-team field? Maybe a 16-team field. You'd love to draw up a bracket where every conference champion gets a slot. It isn't happening. Bill Hancock, the man in charge of this season, has insisted from the first argument that this was a four-team playoff, and four is where it will stay. Anything more dilutes the regular season to an unacceptable degree. So stop the yapping. It isn't going to happen no matter how much sense you believe it makes. It isn't happening no matter how you rate conference titles vs. the regular season. Still, people howl. Why, Penn State could win the Big 10 Championship, and it beat Ohio State head-to-head. So you can argue that it's unfair. But this Committee was never meant to decide backyard spats over conference titles. This year, there are four teams who played in a major conference and lost one game or fewer. Don't those teams deserve to go to a playoff? Don't the top four teams in the polls? Hey, in the AP Poll, Penn State is the fourth-highest ranked team in the Big 10. Why, say others, isn't an unbeaten Western Michigan team in the field? Well, because they play Akron and Toledo and Georgia Southern and North Carolina Central. The road to the playoffs doesn't go through Statesboro, Ga. It never has. Do you think, for a second, that Western Michigan would be in the conversation if the BCS system was still in place? Or the argue-the-loudest-over-the-AP-Poll system before that? Frankly, the college playoffs make better sense this year than the year before (when Baylor could have gone without argument). Look, I feel for Penn State. On the other hand, they lost twice. The polls have three teams rated higher. Winning the conference is nice, but it has zero to do with the College Football Playoff Committee. 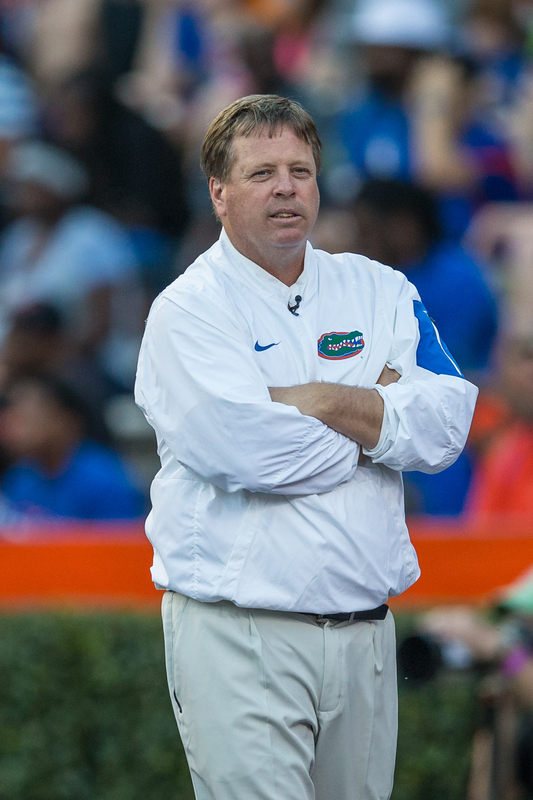 Look, if Florida somehow upsets Alabama Saturday, do you think the Gators would go to the playoffs? No. And frankly, they aren't anywhere close to one of the four best teams in America by any measurement. Look, if Penn State had as good a record as Ohio State, yeah, they'd have a point. But they don't have as good a record. You can look it up. Frankly, I'm a big fan of strength of schedule. But remember back in 2000 when FSU was picked over Miami to play Oklahoma for the national title in the Orange Bowl, in part because Miami played a dreadful schedule. Oklahoma beat FSU, and everyone argued for days on end that UM should have gone. Maybe. But they didn't deserve to go with their schedule. After that, the voters seemed to conveniently forget about the strength of schedule. I don't think they should have. Here's what you have to remember. It isn't the Committee's charge to reward a three-loss team that is playing good at the end, or to open the door for good seasons by mid-level teams, or defend the Heisman, or to comment about how Tom Herman will do at Texas, or whether Jim McElwain ought to be interested in Oregon or whether Blanchard and Davis were better than the Four Horsemen. Their charge is to pick the best four teams. Period. After that, the rest of us can go back to arguing. Ok, ok, you convinced me. You were right. But lost in all this is how strong the Big Ten is this year. Did anyone think a conference other than the SEC would have 4 teams in the top 7 of the CFP rankings this late in the year? Ok SEC fans let’s say it together. The Big Ten is the best college football conference this year. Larry, the Big 10 was excellent this year; the SEC was not. Not only did you have four of seven, but each of them has a solid argument for the playoffs. I’ve always thought the SEC had great teams, and they played for national titles. But the SEC has always had weak teams, too, to help prop up the good ones. But the East isn’t what it was, and even the West went from great depth to pretty good depth. I have zero problem saying the Big Ten is best.